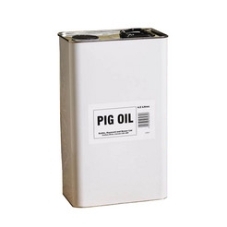 Pig Oil 4.5ltr. Oil to hydrate and condition the skin and prevent drying. Used on horses to help prevent mud fever and also to discourage mites when mixed with sulphor powder. Said to work as detangling lotion for mane and tail.